Dropbox’s camp had a busy week, unleashing a slough of new apps and services on Wednesday that push the company away from strictly storage and into the lifestyle app arena. Carousel was one of them, an app for curating, storing, and sharing photos and videos that launched on both Android and iOS. It’s essentially a photo-managing tool integrated with Dropbox, putting all of the pics from your phone and your Dropbox account into one convenient spot, with some nifty social and sharing features to boot. Carousel syncs up with Dropbox and has a built-in messaging system. It seems like Dropbox is hoping Carousel will be your new go-to photo manager, one that can practically replace the stock photo tool that’s a fixture in your phone’s operating system. To get started, you need to setup a standalone Dropbox account (if you don’t have one already), as Carousel relies on your already allotted storage amount (you get 2GB of storage for free, but you can either earn additional free storage or buy more space). 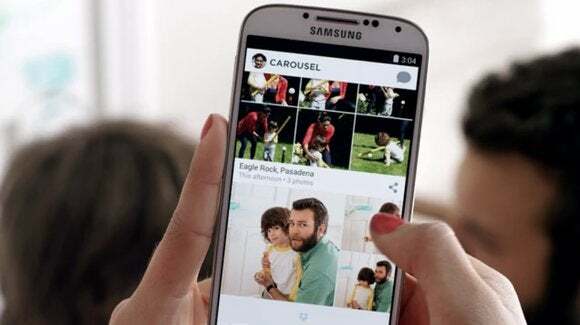 Carousel then imports your phone’s entire photo collection, and saves each photo to Dropbox. This process can take a bit of time, depending on how many photos you have saved, but it seems quick—you can still access and view photos as they’re saving. Once saved, you can access your photos through Dropbox’s app or desktop client at any time, but Carousel has all of the fun sharing features. Much like iOS’s Camera Roll and Android’s Gallery, your photos are sorted by date. 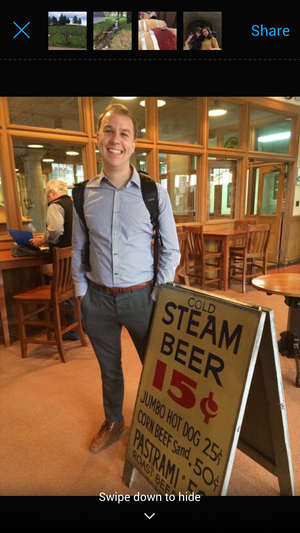 If you took several photos at the same location in a single day, Carousel groups those together and labels the collection with the location name. It has a similar feel to the Moments feature in iOS’s Camera Roll, though Carousel’s thumbnail images are a bit larger. Android users, on the other hand, will find Carousel’s layout to be a bit different from their Galleries, with thumbnails for each individual photo displayed in a timeline. Swipe up to share, or down to hide from your main feed. Tap on an individual photo to view it full screen. From there, you can swipe up to share it—it either joins a collection you’re already creating to share, or you can share it on its own—or swipe down to hide it from your Carousel feed. Hidden photos are still saved and stored in Dropbox, but are stored in a separate album from your main Carousel feed, if you’re looking for more privacy or if you’d just like to keep your master collection clutter-free. Carousel puts a lot of emphasis on storing an entire lifetime of photos in one spot, but scrolling through an entire lifetime of photos just sounds like a major pain and an inefficient way to find what you’re looking for. That’s why Carousel has a handy timeline on the bottom of the screen that allows you to scroll horizontally to a particular date, month, or year. The app zips through your collection as you slide through time, so you can quickly see your other photos before you settle on the timeframe you’re looking for. Share your photo collection through Carousel's built-in messaging tool. 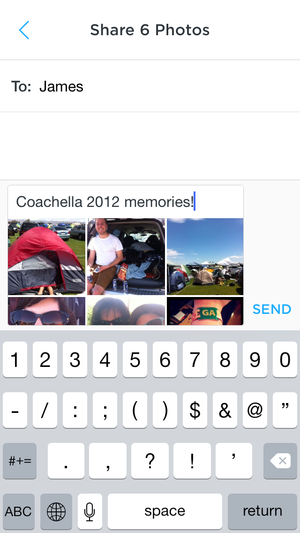 Besides just storing photos, Carousel has an easy-to-use sharing feature, which has a message-like feel to it. To share photos, tap the share icon above a photo or collection of photos; you can also swipe up on an individual photo you’re viewing full screen. 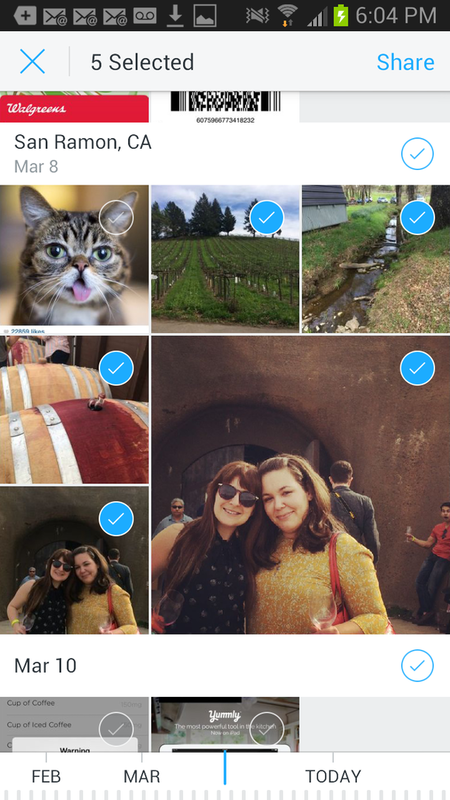 The idea is to curate photos into sharable albums based around a theme or an event, but you can pick and choose whatever photos you’d like; check (or un-check) any additional photos to share. Then, select whom you’d like to share these photos with. Carousel connects to your phone’s contacts, so just enter a name and select as many contacts as you’d like. You can also add a message to send along with your photos. When a friend shares photos with you, you’ll get a message and notification from Carousel, and the shared photos can then be stored in your own collection. It’s a great way to collaborate on group albums with other Dropbox or Carousel users. Logs of past and current messages are stored in the app’s Conversations tab. I’ve only been using Carousel for a few hours, but I’m thoroughly impressed with the app’s design and familiarity. However, I’m a Dropbox user—I already use Dropbox daily to access documents and photos across various devices—so your personal preference will probably depend on how deep you are into the Dropbox ecosystem. Though Carousel is a third-party app, it feels like it simply belongs on your phone, like it should have been there the first place. I find it easier to navigate than both iOS and Android’s native photo apps, with a better layout and aesthetic as well. It’s intuitive, syncs quickly, and makes it easy to both share and back up your precious photos. 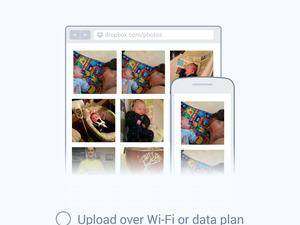 This story, "Hands on with Carousel for Dropbox, your new mobile photo hub" was originally published by TechHive.